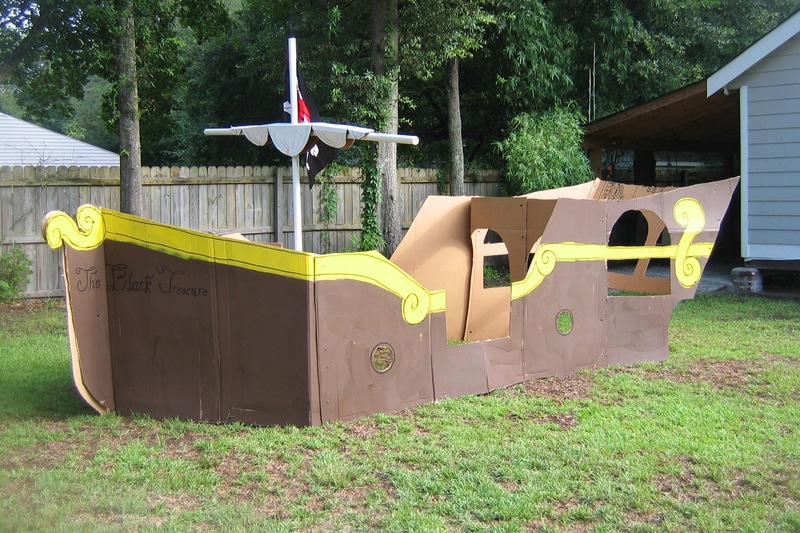 I know it is crazy to plan a backyard birthday party in late August in South Carolina, but my son wanted to dig for treasure, and I saw this great cardboard pirate ship at Mr. McGroovy’s. The day was super hot and humid, but everybody had a great time (and I lost five pounds) so it all worked out! The Invitations: I ordered blank invitations from Fine Stationery and ran them through my home printer. The invite said things like, “Aaaargh Mateys” and “Join (name) for pirate adventures and buried treasures” and “RSVP to the first mate or prepare to walk the plank!” The font, Blackadder, is very pirate-y looking. The Pirate Ship: Plan ahead! It took several weeks of calls to every appliance store in the area to collect all of the refrigerator boxes I needed for the pirate ship. We then spent two weekends cutting and painting the boxes. The assembly wasn’t too difficult, and Mr. McGroovy’s instructions are pretty simple. 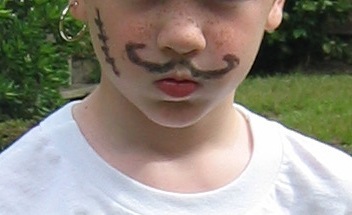 The Outfits: As guests arrived at the party, we painted faces with scars, mustaches, and beards. We also gave each guest a man’s white t-shirt that we had cut along the bottom to look like rags. We offered red sashes (plain red fabric cut into strips) and bandanas to each child too. 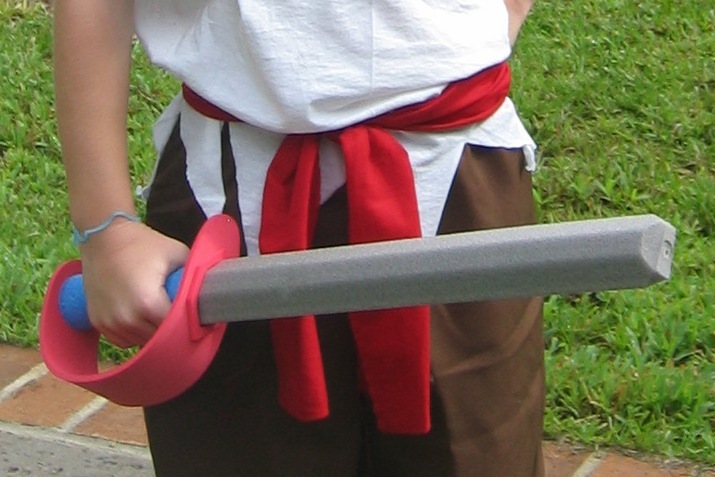 The foam swords came from the $1 aisle at Target. The Treasure Hunt: On brown paper grocery bags, we printed different clues/riddles that sent the kids all over our front and backyard. We buried two separate treasure chests (shoe boxes painted brown). The pirate chests were filled with plastic jewels, plastic insects, individual candies, dice, and other booty from Oriental Trading. The Treat Bags: We ordered black drawstring bags along with the other loot. We wrote pirate names on playing cards and tied those to each bag. The guests put their loot in the bags after the treasure hunt. my kiddo is about to start high school, but his friends STILL love the party favor scavenger hunt in and around our house. I put them on color coded teams with rhyming clues. (when they were emerging readers i always made sure that i had one really good reader in the group.) “Round and round and round it goes, this is where we wash our clothes!” (the next clue is hidden in my washing machine). the teams hit all the clues, but in a different order. it’s a bit chaotic, but there’s lots of laughter during the process. as they got older, they appreciated Baskin Robbins type gift certificates to go get a treat with a favorite adult as the party favor.